Awarded the 2016 International Academy of Astronautics Life Science Book Award! Using anecdotal reports from astronauts and cosmonauts, and the results from studies conducted in space analog environments on Earth and in the actual space environment, this book broadly reviews the various psychosocial issues that affect space travelers. Unlike other books that are more technical in format, this text is targeted for the general public. With the advent of space tourism and the increasing involvement of private enterprise in space, there is now a need to explore the impact of space missions on the human psyche and on the interpersonal relationships of the crewmembers. 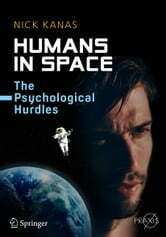 Separate chapters of the book deal with psychosocial stressors in space and in space analog environments; psychological, psychiatric, interpersonal, and cultural issues pertaining to space missions; positive growth-enhancing aspects of space travel; the crew-ground interaction; space tourism; countermeasures for dealing with space; and unique aspects of a trip to Mars, the outer solar system, and interstellar travel.